A grand ceremony was held in Hanoi on January 6 to celebrate the 70th anniversary of the first general election of the Vietnamese National Assembly. Attending the event were Party General Secretary Nguyen Phu Trong, former Party General Secretary Le Kha Phieu and Nong Duc Manh, President Truong Tan Sang, former President Le Duc Anh, Prime Minister Nguyen Tan Dung, National Assembly Chairman Nguyen Sinh Hung, former National Assembly Chairman Nguyen Van An, and President of the Vietnam Fatherland Front Central Committee Nguyen Thien Nhan, among others. Chairwoman of the Lao National Assembly Pany Yathotu, President of the Cambodian National Assembly Heng Samrin, and representatives from the diplomatic missions and international organisations also attended. Addressing the event, Party General Secretary Nguyen Phu Trong said that on this day 70 years ago, all Vietnamese citizens from all walks of life aged from 18 responded to the call of President Ho Chi Minh to go to the polls to elect the first National Assembly. The important event went down in the Vietnamese history as a vivid milestone, marking a great stride in the establishment of a democratic institution and opening up a new development period for the country, he said. This was the first time in history, Vietnamese people rose out of the slavery status and became citizens of an independent state who could make their own decisions on their destiny and select and build a democratic republic regime. For the first time, Vietnam had a body representing people’s will, aspirations and right to mastery that decided the country’s important issues, the Party Chief stated. He affirmed that the success of the election was the triumph of people’s patriotism and the sound revolutionary guidelines adopted by the Communist Party of Vietnam and President Ho Chi Minh. The birth of the National Assembly was the fruit of the people’s revolution under the clear-sighted leadership of the Party and the late President Ho Chi Minh, he added. The legislature has served well as the people’s highest representative body and the most powerful state body of the country, whose position and role are consistently confirmed in the Party’s political platform and policy and institutionalised in all Constitutions the country had, he stressed. During the nation’s industrialisation and modernisation and international integration process, the legislative body has tough tasks that require it to build on the achievements gained over the past 70 years to increase the quality and efficiency of its operations to better meet the requirements in the new period of development, the leader said. Together with boosting legislative activities, the NA should renovate and raise the effectiveness of its supervision work with the focus on big and urgent socio-economic issues. The law-making body needs to make qualitative decisions on the country’s important issues to ensure the national interests meet people’s will and aspirations and step up external relations and parliamentary diplomacy in order to contribute to the successful implementation of the foreign policy of openness, multilateralisation and diversification of the Party and State, he suggested. 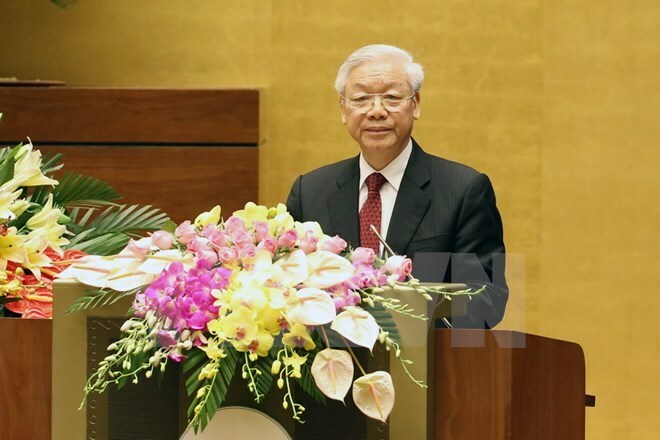 Speaking at the ceremony, NA Chairman Nguyen Sinh Hung affirmed that each Constitution, each law, each resolution and each important decision made by the legislative body is connected closely with the nation’s destiny. Every achievement reaped by the NA was generated by the strength of the great national unity, as well as the support of Vietnamese people and peace-lovers all over the world and the international community, he stressed. The successful first general election on January 6, 1946 went down in history of Vietnam’s revolution as a turning point, featuring the country as an independent state and a people’s democratic state – the first of its kind in Southeast Asia and Africa, said National Assembly Chairman Nguyen Sinh Hung. Talking to the Vietnam News Agency on the occasion of the 70 th anniversary of the first general election, the NA Chairman affirmed that the event represented the symbol of the national will and strength. The body has also hosted a number of important events, including the 132 nd Inter-Parliamentary Union General Assembly in March 2015 – an important premise of the World Conference of Speakers of Parliament, which had important contributions to the 2030 Agenda for Sustainable Development. Top Vietnamese leaders paid tribute to late President Ho Chi Minh at his mausoleum in Hanoi on January 6 on the occasion of celebrating 70 years of Vietnam’s first General Election Day. Attended at the ceremony were Party General Secretary Nguyen Phu Trong, President Truong Tan Sang, National Assembly Chairman Nguyen Sinh Hung, Prime Minister Nguyen Tan Dung, and President of the Vietnam Fatherland Front Central Committee Nguyen Thien Nhan. Former leaders of the Party, State, NA and government were also present at the event to show their respect and gratitude to late President Ho Chi Minh who made significant contributions to national building, liberation and independence. The Tan Trao National People’s Congress was the precursor of the Vietnam National Assembly. Following the successful Congress, the Vietnamese people held a general election on January 6, 1946 to elect the country’s first National Assembly. Over the past 70 years of establishment and development, the Vietnam National Assembly has become stronger as the highest State power body. Apart from exercising the constitutional and legislative powers, the NA makes decisions on national important issues and conducts the supreme oversight over the State’s activities. Carrying both domestic and external affairs, the NA has fulfilled its missions in law-making, especially the creation of the Constitution 2013, which provides a firm foundation and long-term orientations for the country’s development.